I began recording some songs in September 1999, did a week or so in Windmill Lane, maybe 9 songs. No plan, no rush..... Every now and then I'd quietly slip into the studio, and do a day or 2 with some of these songs. Little by little the songs took shape; different musicians coming in to play; all very relaxed, no pressure. Right up to the end I kept my mind open for new songs, and for new ideas...... This is the first time I felt confident in a studio; finally I have found a relationship with a studio and an engineer, where I feel capable of expressing myself, without (too much) fear. A few words on a few of the songs, Love Is A Place I Dream Of, Soshin, As I Waved Goodbye, and Hands Of A Farmer. By 1998, I had made 3 cds for Warners in the US, and one for Sony in the UK (Salty Heaven). While the Warner years were good ones, the Sony experience was one that would make you either crawl into bed to hide from the world; or fight back. I'm Irish, so here we are. I had to find a way to make music, and present it to the world, without feeling I had no control over my working life.... It was time for a change.... 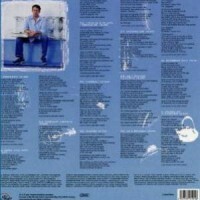 Between The Mountain And The Moon is a very special cd in my life. It is the first cd of my songs which I own. I took my time.... Every musician who came into the studio brought real magic to the songs. I really feel that these songs were given the time and space to fully realise their potential. It was a joy to work with Mohamed Bouhanna, a wonderful Derbouka and Bindir player. He was born in Oman, lived in Algeria, before moving to Holland, where he now lives in Groningen. 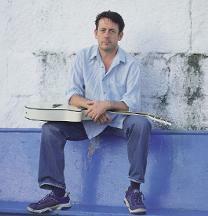 I met him in a Moroccan restaurant in Groningen in 1999; and we played together that evening. Mohamed was the first player to record on this cd with me. Two years later, Sinéad O'Connor became the last person to perform the songs with me. Having the opportunity to sing with Sinéad was a great privilege to me and an indication that this cd is somehow blessed. But I really have to thank all the great musicians who surprised me with their ideas and creativity on this record. ...Between the Mountain and the Moon sounds like one seamless session, intimate, impassioned, and musically, lyrically, and thematically unified, an album in the classic sense. While Luka was concentrating on the cover songs he radically retooled for Keeper of the Flame, he said he learned "to trust myself more as a singer." .... Most importantly, Luka has learned how to enjoy life in the recording studio. He's always been comfortable on a stage with just himself, a couple of guitars, and maybe a vase of flowers.... "I began recording some songs in September 1999, did a week or so in Windmill, maybe nine songs," explains Luka, ... "No plan, no rush.... Every now and then I'd quietly slip into the studio and do a day or two with some of these songs. Little by little, the songs took shape, different musicians coming in to play, all very relaxed, no pressure. Right up to the end I kept my mind open for new songs and for new ideas. Each person who plays on this CD brought something very special to the songs. Almost every note people performed remains in the mix. Every session was essential, and something beautiful happened each time." 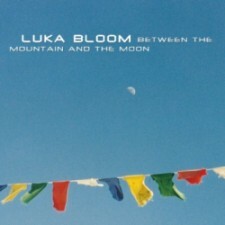 Between the Mountain and the Moon is a collaboration among several musicians, including Luka's gifted nephew Connor Byrne, a flautist and recording artist in his own right who accompanied Luka on Salty Heaven. For many, perhaps the most noteworthy participant will be Sinead O'Connor, a significant but last-minute addition to the lineup, who came in to lend her voice to one track but, following the free-form spirit of the project, stuck around to contribute subtle but stirring vocals to a few more.... Love is definitely on Luka's mind here, be it sensual ("Monsoon") or spiritual ("Gabriel"). But Between the Mountain and the Moon is about more than that. It's about playful pride for a home and a heritage ("I'm A Bogman"), the courage of commitment to faith ("Soshin"), dedicated to Maura O'Halloran, an Irish-American woman who became a Zen Buddhist monk in Japan) or to a cause ("Love is a Place I Dream Of", dedicated to Christina Noble, a Dubliner who has devoted her life to sheltering homeless children). It's about extraordinary characters in an exotic land ("As I Waved Goodbye", inspired by the book Seven Years in Tibet) and humble heroes in a more familiar setting ("Hands of a Farmer", a tribute to County Clare singer and storyteller Micho Russell). Finally, it's about the simple pleasures of picking up the guitar ("Perfect Groove") and those moments when everything just feels right ("Rainbow Day"). Between the Mountain and the Moon is full of moments when everything just feels right. It's Luka Bloom's most mature work, yet it's as fresh as his decade-old debut, a soulful, occasionally joyful, consistently moving album that was definitely worth the wait.